One of the major benefits of SharePoint is its ability to be used as a document repository. You can have documents from a variety of sources such as email attachments, shared folders, intranet sites and FTP sites that are brought into SharePoint Libraries for sharing and document storage. However, these documents that come from delivery systems are not updated with the appropriate metadata. The relevant metadata is usually stored in systems such as customer databases. It is necessary to keep such metadata updated in SharePoint so as to bridge these documents with the necessary information that enable users to find, share and collaborate with documents better. 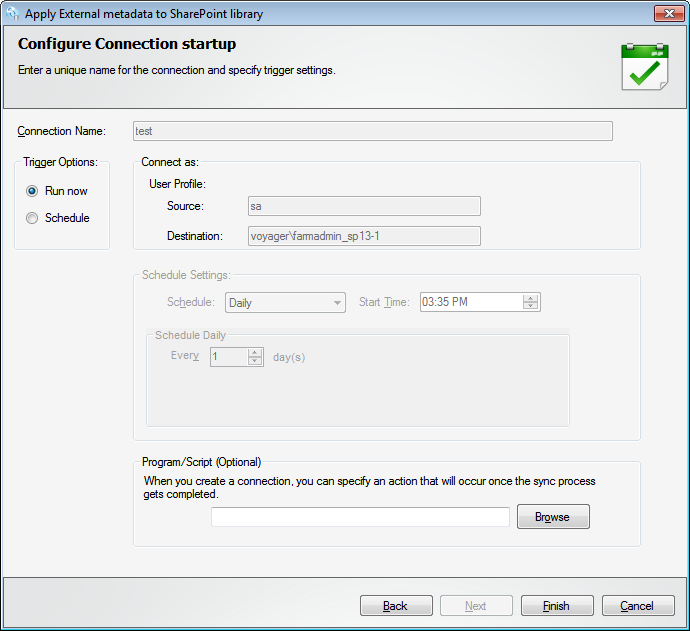 The External Data Connector for SharePoint builds this bridge and helps you update SharePoint metadata regularly. It can connect to an external database, map necessary columns and apply the new metadata to document libraries. The tool takes care of importing and updating metadata in documents from an external application database, say your HR or CRM application. Such automation cuts down the costs an operation like this would otherwise incur when done manually. Thus your documents stay updated with the latest metadata. Here’s how the External Data Connector for SharePoint helps you do this task. 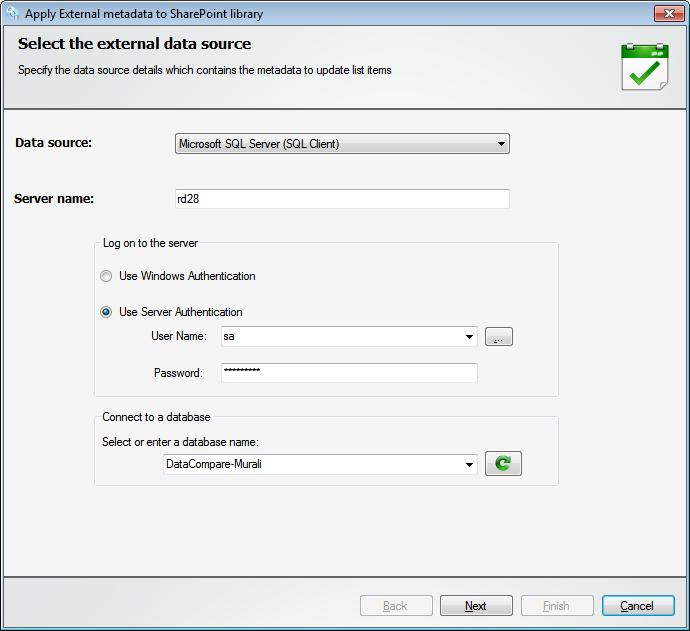 Select the external database from where you want to import the metadata. Here for example is an external SQL database. Next you need to indicate the SharePoint Library where you have the documents / records stored and which need to be updated. Here’s how you do that. 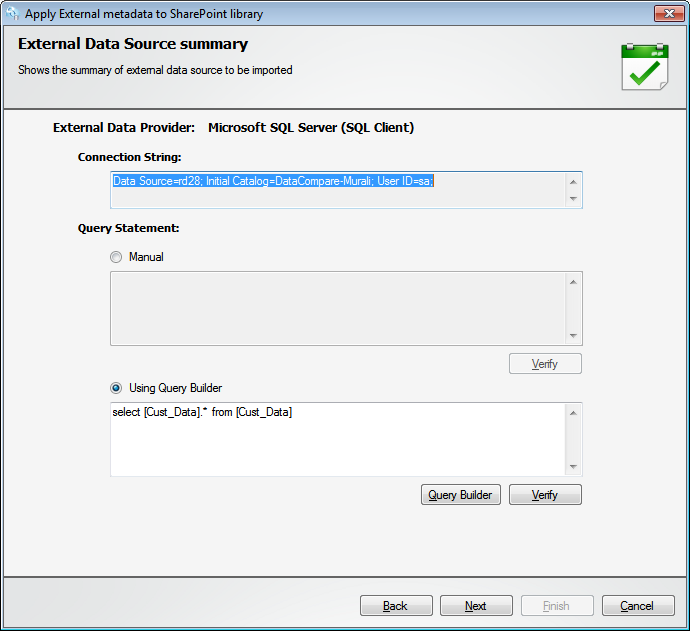 Use the Query Builder in the External Data Connector to identify the exact Tables/Records that you want to use to update the metadata of the SharePoint Library. Here’s a sample selection shown in the image below. To make sure the metadata is updated properly, the columns in SharePoint must be properly mapped to the columns in the source of the data imported from an external source. Besides this, you must specify a reference column which will serve as the focal point in comparison and update of metadata in the SharePoint Library. Here’s a screenshot showing mapping of columns. Save the task by giving it a unique name so that it can be identified and repeated later if necessary. Here’s a screenshot showing that. When you are done, you can check the SharePoint Library metadata columns to see how they have been updated. 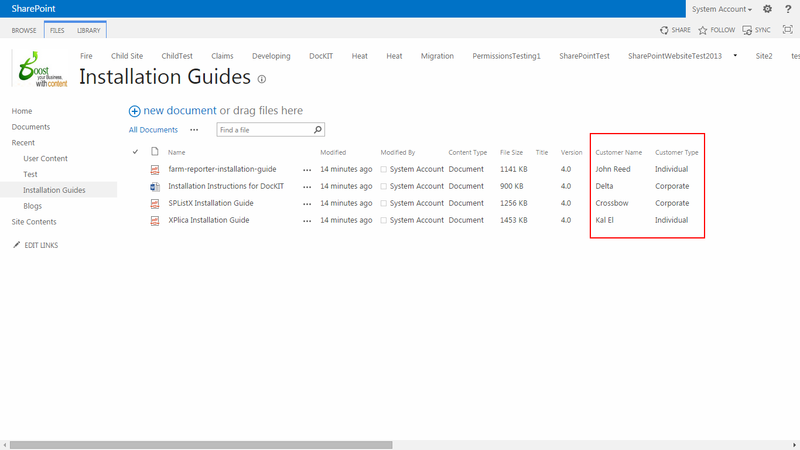 Here for example is a sample SharePoint Document Library named Installation Guides containing imported files. As marked in red, a couple of columns that match the columns in the external original database have been updated with new values. 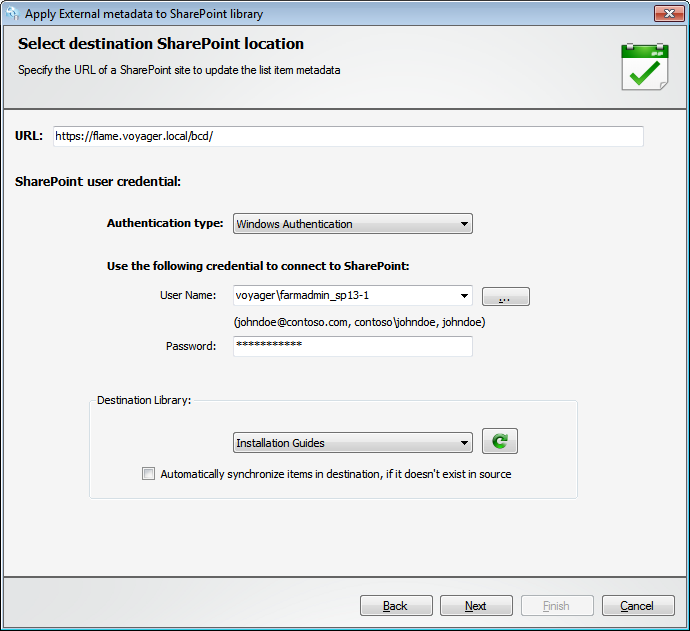 The External Data Connector builds a bridge between the SharePoint Library and the external source from where the data was imported. 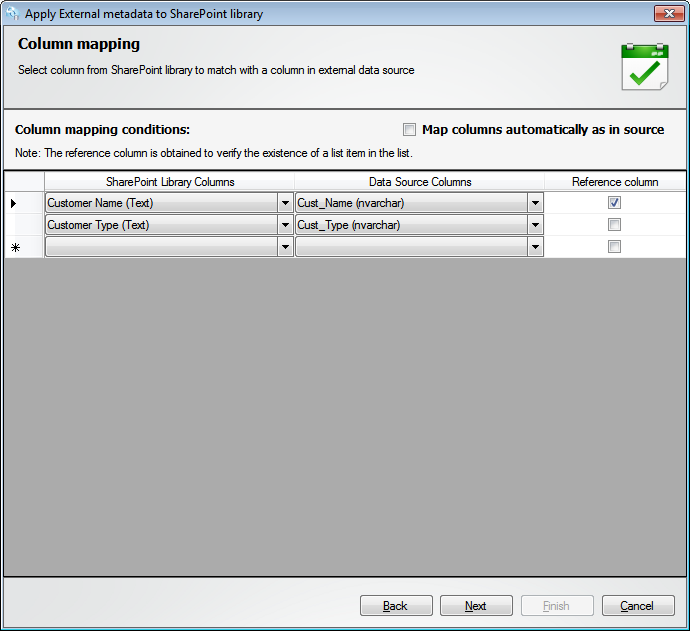 This allows users to map columns of their choice and update the metadata as necessary.